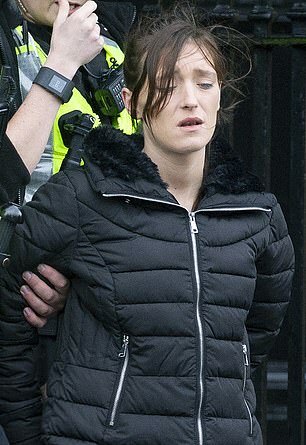 A British woman travelling with a family accused of causing chaos in New Zealand today admitted stealing Red Bull, rope and sunglasses from a service station. Tina Maria Cash, 26, stole from the store in Albany, north of Auckland on December 31 and January 4. Another woman distracted the attendant by buying cigarettes while she made away with the items, a court heard today. 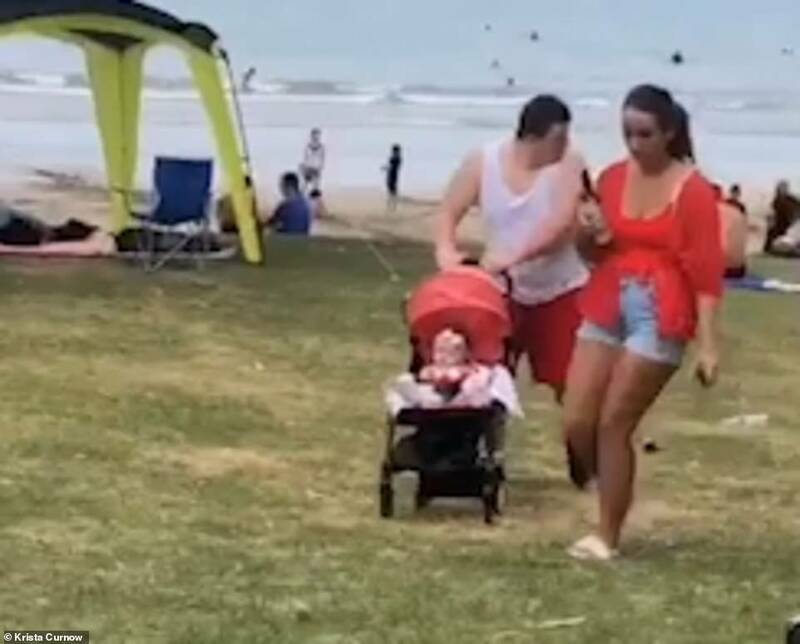 Cash, who arrived in New Zealand on a six-month travelling visa on 29 November, claimed she did not remember the theft – but she was caught on CCTV, reported Stuff. She pleaded guilty and was ordered to pay back $55.20 for the items she stole. 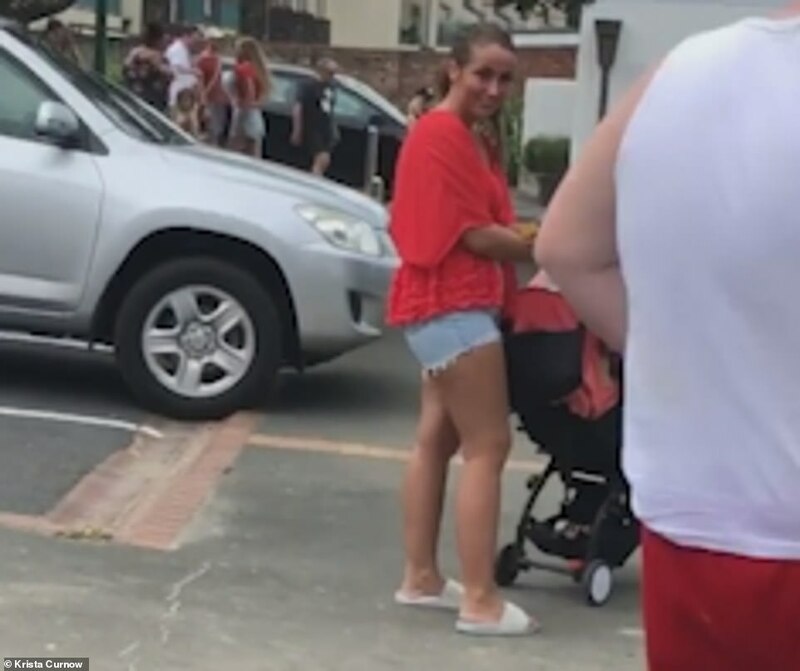 On her way into court, she was accompanied by several tourists including a shirtless toddler who pulled the finger and yelled at reporters. 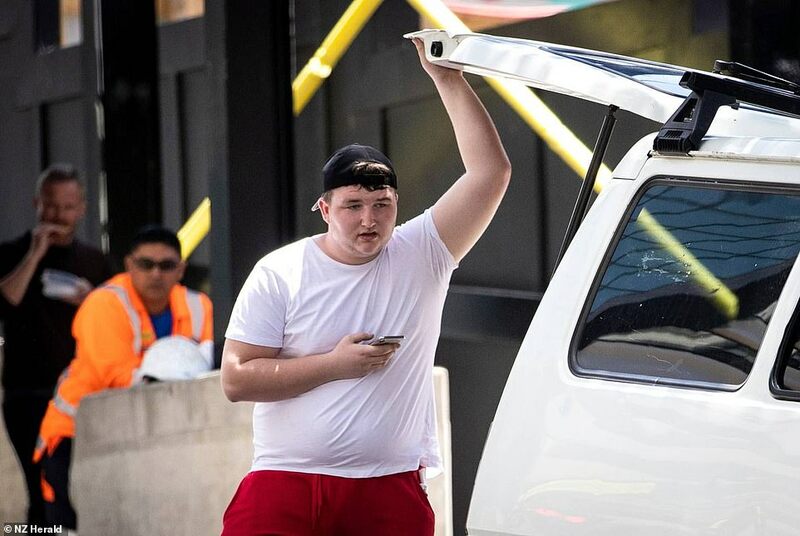 Cash is travelling with an ‘unruly’ British group which is reportedly set to be deported after locals say they wreaked havoc across the country. 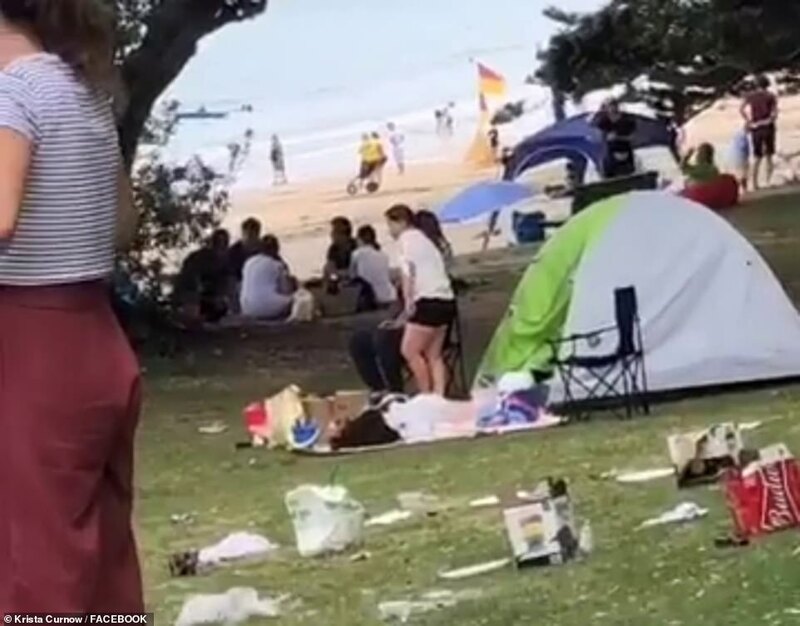 The tourists, believed to be from Liverpool, face claims they trashed a beach, left a cafe without paying, damaged their apartment and allegedly stole a journalist’s phone. 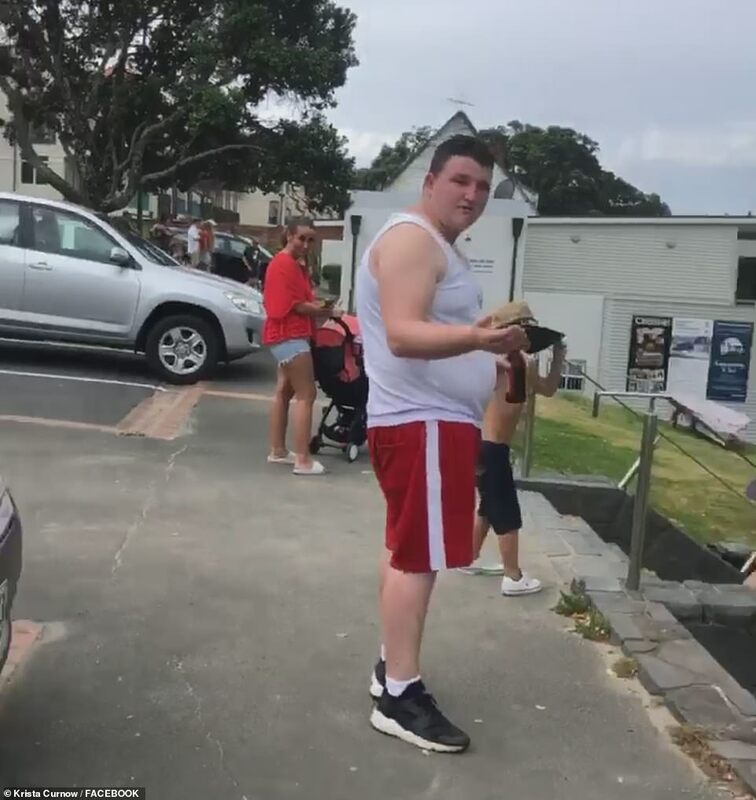 A young boy in the group also threatened to ‘knock the brains out’ of a woman who had filmed them littering on a picturesque Auckland beach while the family have also been accused of putting ants and hair in restaurant meals to avoid paying the bill. 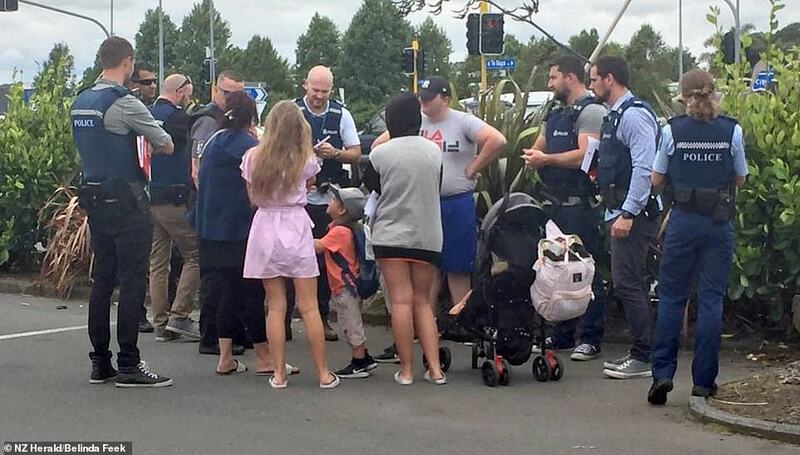 The group of around 12 includes brothers John and David Johnson, their partners, children, and mother, Eileen Doran, from Liverpool, who arrived in New Zealand on Friday. 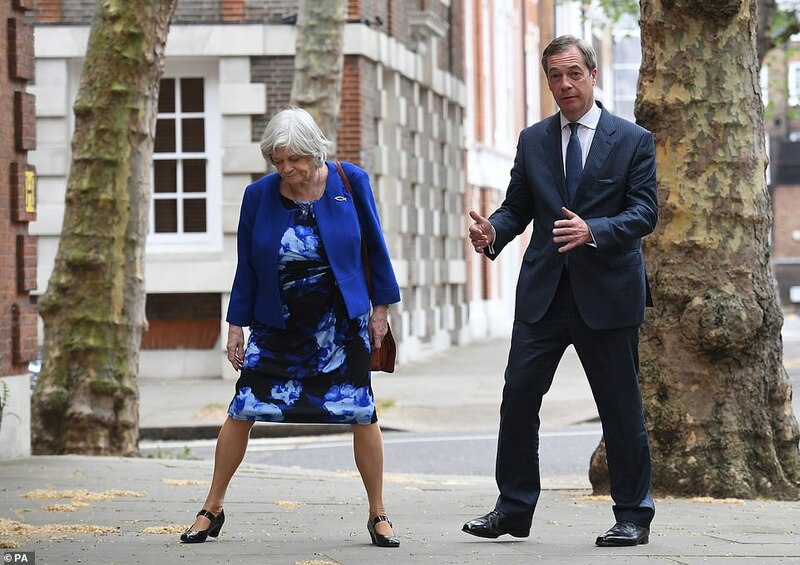 They said they are a ‘respectable’ family who were ‘here to see the Hobbits’ – but their plans have been ‘f***** up’ by the accusations against them. 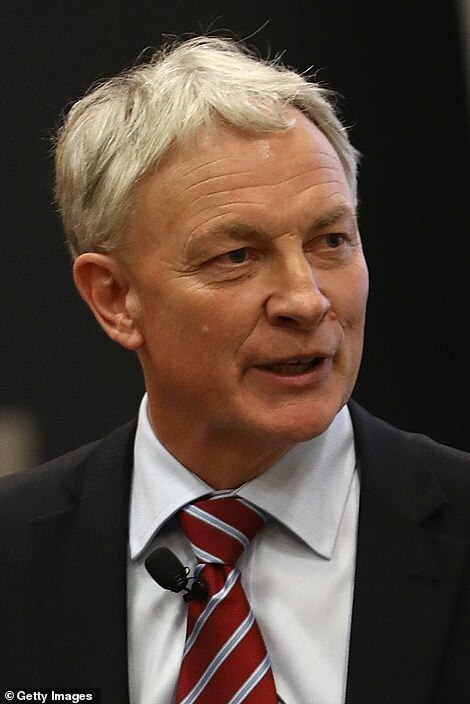 Their stint of mayhem across New Zealand led to the group being labelled ‘a*******’ and ‘trash’ by the mayor of Auckland, Phil Goff. A petition calling for their deportation has now amassed more than 2,500 signatures. On Tuesday night there was a heated stand-off in which police were called after the family were seen walking through a Burger King drive-through. The family, who denied being ‘gypsies’, earlier said they were going to cut their holiday short after denying they were responsible for the series of incidents. 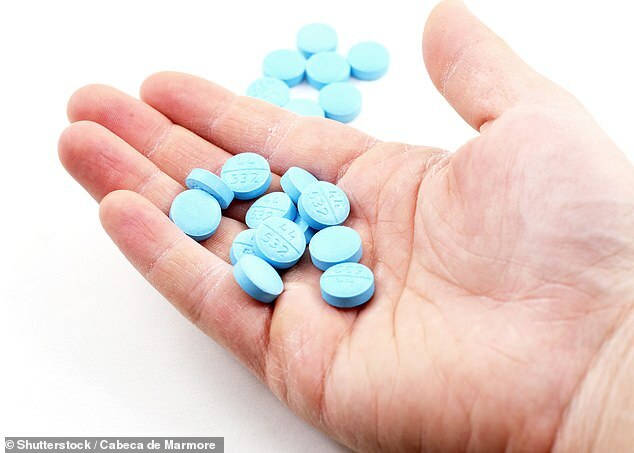 In an interview with the New Zealand Herald, family member David Johnson said he was stunned by the backlash against them. 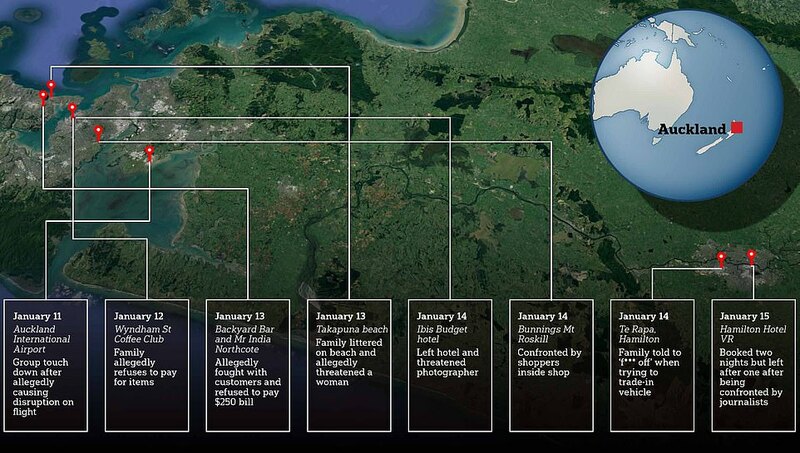 After the publication tracked them down at a hotel in Hamilton, one of the brothers protested over being filmed and grabbed the phone from the reporter’s hand and deleted the footage before handing it back. ‘We were sitting there, and a little boy smacked one of the kids. 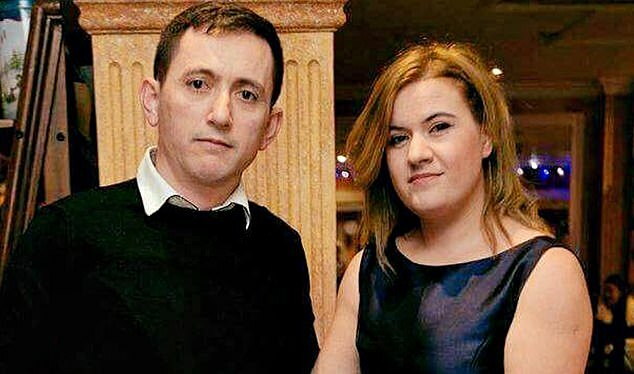 They come over and start calling us loads of names ‘go back to Ireland.’ We’re sitting there having a meal and we’re relaxing,’ the boy’s father David Johnson said. Establishments around Auckland on New Zealand’s North Island have complained the group put ants and hair in their meals in an attempt to get their meals for free and abused staff. ‘They asked me for the total bill. 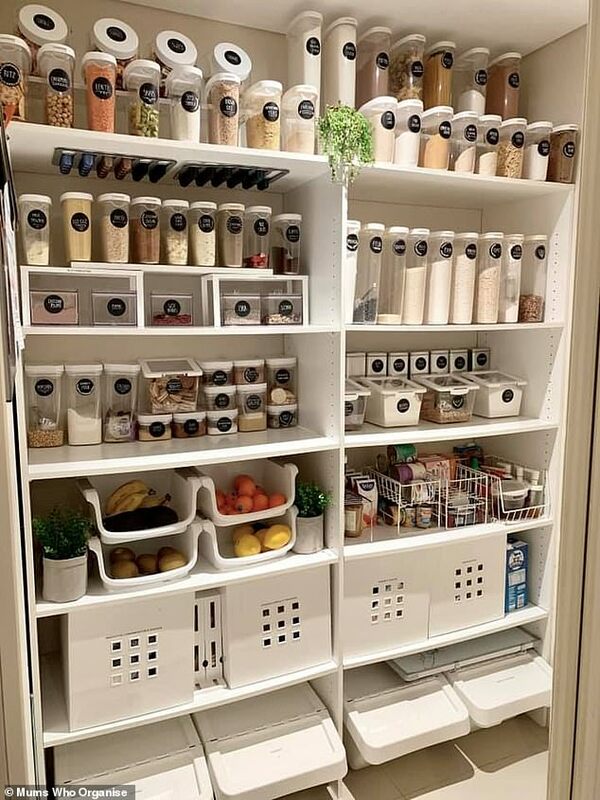 I told them it was $114 and I had to repeat myself a few times before all of a sudden one of them said ‘have a look at this, there is a hair in my food’,’ he told the New Zealand Herald. A woman with the group then pulled a hoodie over her head before getting into their white van, slamming the vehicle door into a nearby car as she did so. The tourists also allegedly caused havoc on their flight into the country. On their flight over, they reportedly demanded large seats, continuous requests for alcohol and a dirty nappy left in an overhead bin. One passenger on the Cathay Pacific flight from Hong Kong to Auckland on Friday told the New Zealand Herald the family made the journey the ‘worst flight’ of his life. Before the flight departed, both children gallivanted around the plane’s aisles and a daughter allegedly yelled at her mother who demanded food from staff, the passenger claimed. ‘The parents also asked for different seats because they are overweight and didn’t have enough space, even insisting the attendant ask another couple with the only free seat on the plane to switch with them,’ he said. ‘They would lean against us often with an armpit on my head or an entire arm blocking the movie I attempted to watch. I was already boiling at this point, so asked the attendants if we could move. They were also accused of damaging an apartment which they had stayed in. He claimed the group requested a year-long lease but were offered a studio apartment for a week. After accepting the offer, they allegedly tried to break into a bigger apartment. Mr Muhammed said he felt threatened by the group, and when they started stealing cleaning equipment and linen he asked them to leave. On January 14, the group tried to trade in their two vehicles for one at the Hamilton car dealership. But when staff checked the van they found five children in the back with no seats. ‘He was pretty arrogant, soon as he walked in, he approached my boss with a rude voice and rarked everyone up, a lot of arrogance on his side,’ said a staff member at the dealership. 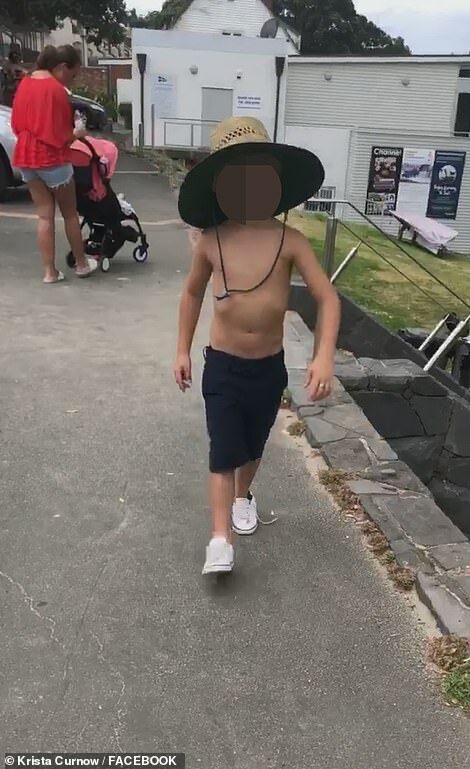 Days later the supposed same group were filmed leaving beer bottles and rubbish on a busy beach, before a child threatened to ‘knock the brains out’ of locals who confronted them in now-viral footage. 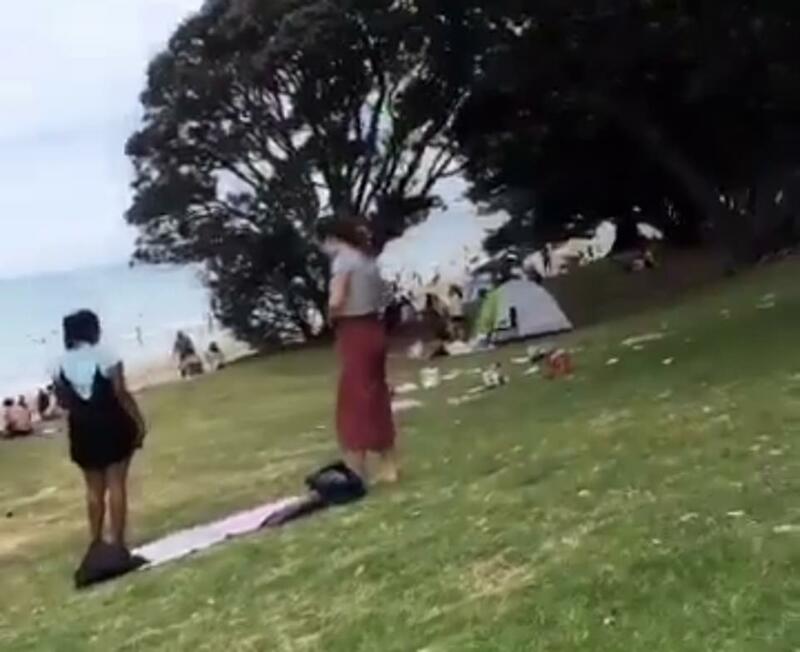 The incident, which unfolded at Auckland’s Takapuna Beach on New Zealand‘s North Island on Sunday, was captured on camera by Krista Curnow. ‘Their response was basically if we have a problem then we can pick it up and that that’s what the council is for,’ Ms Curnow said. ‘I approached the family to ask again if they could not disrespect our country while visiting and pick up their rubbish. 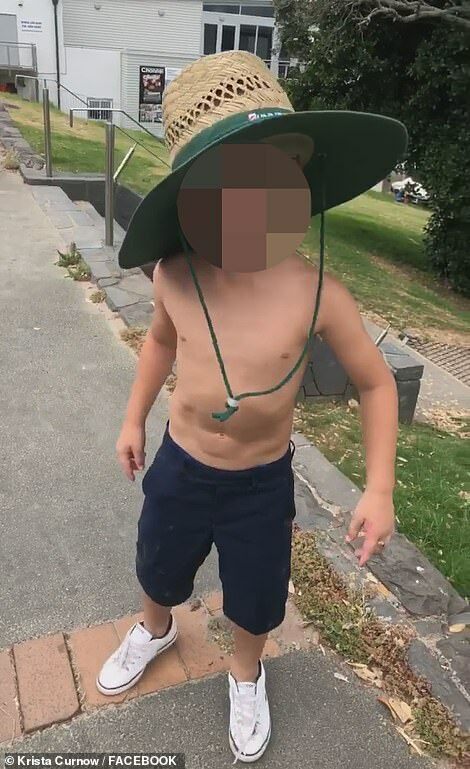 Footage showed a young boy, wearing a wide-brimmed Bunnings Warehouse hat, approach Ms Curnow, telling her: ‘I’ll knock your brains out’. 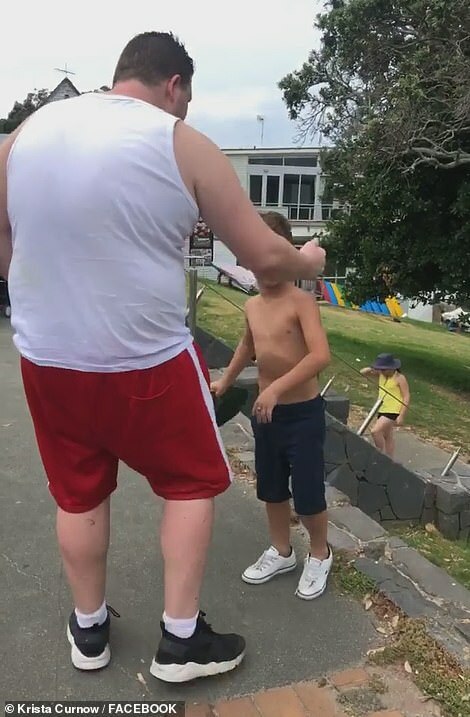 ‘The mouth on that young boy – absolutely disgusting! What kind of role models are the parents allowing this sort of behaviour,’ Ms Curnow said. ‘We just came across him in Bunnings Hillsborough… he was wearing the same clothes,’ the woman wrote on Facebook. ‘My big fat gypsy holiday! Imagine having to sit next to them on a 12-hour flight. Horrendous! Glad you said something,’ one wrote. ‘What did I just watch? 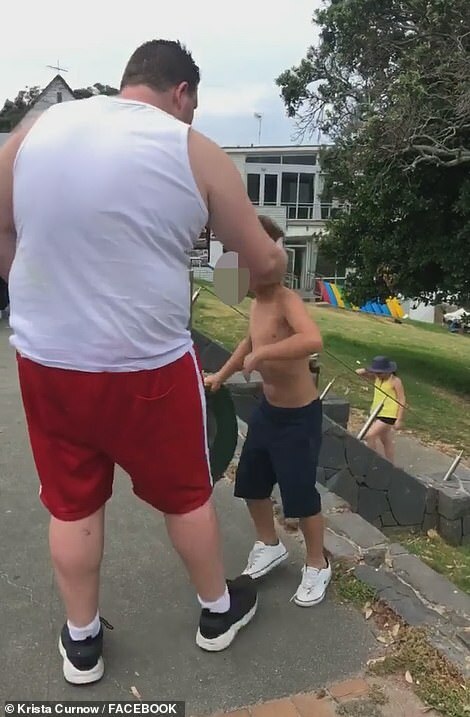 That little boy thought he was so tough,’ another noted. 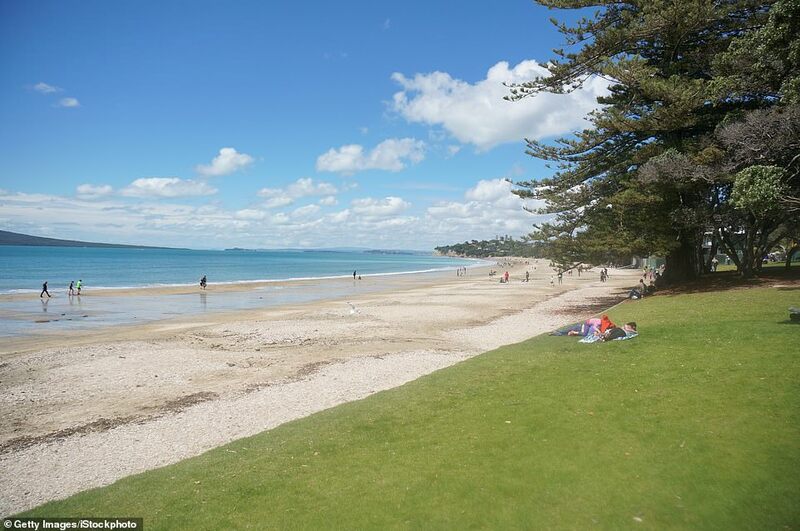 Ms Curnow said she and her friends cleaned up the tourists’ mess, with the help of other beachgoers. ‘I loved how everyone else on the beach came to support and we all picked up the rubbish together! Love NZ,’ she said. 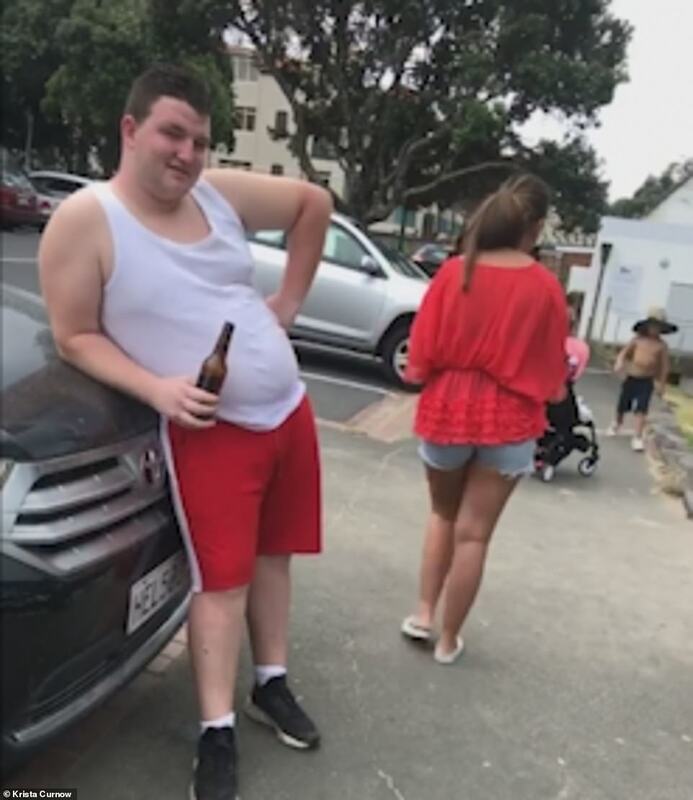 ‘Police will be speaking with those involved and will be referring them to Auckland Council with regard to their behaviour around the littering of rubbish,’ he said. ‘Police would like to remind the public that offenders caught illegally dumping rubbish may be issued with a fine of up to $400. ‘Serious offenders may also be prosecuted under the Litter Act 1979 with a maximum penalty of $30,000.